A short walk from the hotel along the Lungomare Promenade, passing by the famous hotels and villas, coastal cruisers lie alongside the Opatija's harbor waiting for their guests. Following a smooth boarding procedure, refreshing drinks help us relax in deck chairs as the sun beats down on the Kvarner Riviera and the ship sails out across the open sea toward its first destination, a peaceful cove on the Island of Krk. So every day, the first stop can be at either a hidden or well-known public beach, followed by another break in the early to mid afternoon before arriving at the next port. And time flies, at sea sunning on the deck, chatting with fellow passengers, and occasionally jumping off the stern into the deep blue water for a swim. A friendly group of 30 plus guests came mostly from England, Germany and neighboring Italy, as well as from South Africa, North America and Croatia. Croatia has long been one of the favorite destinations for in-the-know Europeans, and it has started hitting the radar in more distant parts of the world. Not only for visiting the historic and cultural attractions of fortified towns, Roman ruins, or museums, but also to bask in the sun along hundreds of miles of jagged coastline, and bathe in the pristine Adriatic waters. Port time is free to explore an ancient city or traditional fishing village, dine in an open air restaurant on fresh fish caught by local fishermen hours earlier, top it off with cold beer or local wine and return on board by midnight; to follow the ship's rule and preserve peace and quiet while the ship rests moored overnight. Riva, usually a walled and paved, with white stone, seaside promenade, is one of the two popular places in Croatia's coastal towns for a daily stroll. The other is the city's Plaza, surrounded by the old palazzos like Stradun in Dubrovnik. 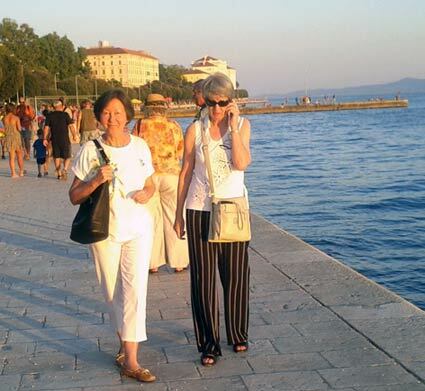 Maja and Jadranka (Croatian for Adriatica) walk along the Zadar's riva to hear the Sea Organ, one of the old city's modern attractions, reputedly playing best at sunset when the sea currents are changing. We disembarked from the Dalmatia at Bozava, Dugi Otok (Long Island), waiving goodbye from the pier for as long as we could see them heading toward a tiny island for the night. Katarina and Mitch, fellow passengers, Captain and crew, it was a great company on a journey full of enjoyable moments, on board and ashore. 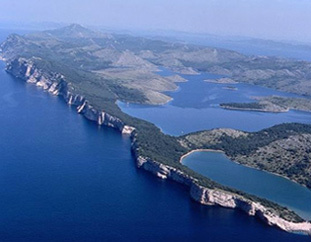 On the Long Island, which in part belongs to the Telascica Nature Park and Kornati National Park, Maja's sister, Lile, welcomed us at her summer home. Schedules on these voyages, from the KL1 to KL8, have been planned for an early morning departure and late afternoon arrival at next destination, including mid-morning and mid-afternoon breaks for a swim, to provide the best of both worlds, a balanced daily pattern of time for relaxation at sea -- sightseeing, dining and entertainment ashore. Most of you express satisfaction in that respect, while some would prefer more time on either side. Interestingly, those who would like to spend more time in port would also like to spend the night somewhere at anchor, rather than crowded with other ships tied-up side-by-side at the dock. Well, we trust that this wonderful service will continue to grow and develop in a way that will soon be possible to schedule a more diverse selection of special interest voyages in addition to those already on offer. 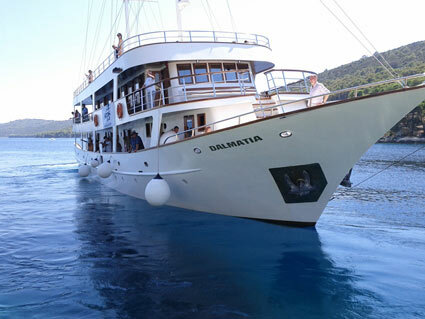 In the meantime, the answer is yacht charter, available at every major port and island along the coast, or group bookings for 12 or more, made well in advance, for which we can arrange a tailored itinerary. 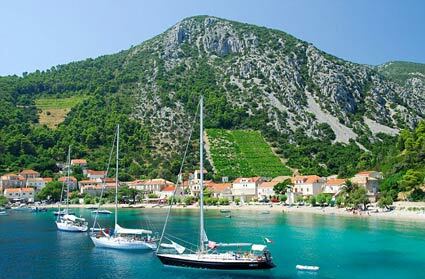 First sight of Trstenik (KL2, KL5) was pretty - its harbour wall, ramshackle roof tiles and compact setting under the wooded hillside. Once we reached the village we found it had a dozy, dusty charm, sleepy waiters sitting by their all-day cafes. It charms because it is unlike busy, over-populated, globalized places in most of Europe. 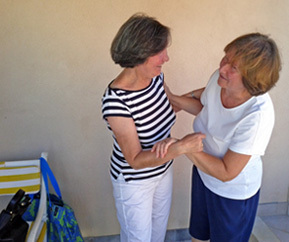 There is no disco in Trstenik, thank goodness. The supermarket isn't much of a place, but we could buy cheese from an ancient farmer under the village tree. 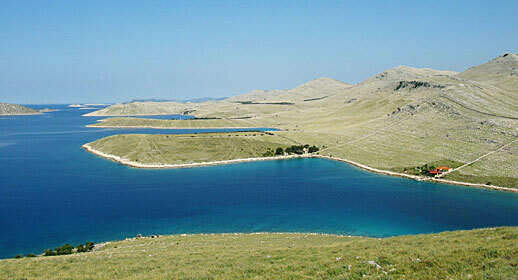 Kornati (KL4) is an archipelago of 140 islands and reefs. A national park in its own right, rich in marine life and boasts a number of historic remains. Apart from a tiny area of cultivated land with fig trees, olives and vineyards, the islands are rocky, covered with thin grass, rare trees and Mediterranean scrubs. Later we stopped at Vodice on our way to Zlarin, a tiny island, traffic-free. 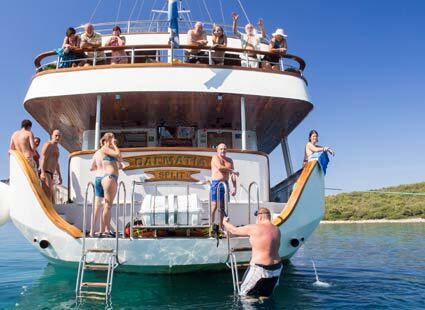 Full mobility is required to negotiate the stairs on board, as well as some energy for longer walks ashore.